Happy Tuesday, Inclusion Lab readers! It’s time for another success story–this one’s for all the co-teachers out there, whether you’re in a teaching partnership now or are planning to be in one next year. Excerpted from Collaborative Teaming, Third Edition, by Margaret E. King-Sears, Rachel Janney & Martha E. Snell. My most successful experience co-teaching came about suddenly and without warning. Our principal notified the general education math teacher and me 2 days before the start of the school year that we were going to be co-teaching an algebra and a geometry class. Did I mention we did not know each other? Did I mention we did not exactly volunteer to do this? Luckily, we were both seasoned teachers in our fields, but I did not find much comfort in this fact at the time. This was a directive coming from our district and one that is probably not unfamiliar for many educators. Almost immediately, a mixed bag of commentary raced through my mind. “This is going to be interesting. They cannot force me to do this. Will we have enough time to plan? I am worried we will not get along.” Even with concerns, I put on a smile and committed to trying to make this a positive experience. My co-teaching partner and I reflected on those initial times together years later, and he admitted that he also made a commitment for a positive co-teaching experience, although he had similar concerns. First, we wanted to ensure students consistently heard both of our voices. Second, we wanted to incorporate both of our ideas in our lessons. He labeled himself the content specialist, and I became the strategy specialist, although there was a lot of crossover in these two areas. Flexibility is key to effective co-teaching. Participants must be willing to get out of their comfort zone, accept that there is never enough planning time, and be okay with the fact that the best laid plans do not always pan out. (This is the real world.) We found a great deal of humor in working through these challenges to our flexibility. Creating a co-teaching lesson plan template was another key to our successful experience. I found this especially helpful because I did not know my co-teacher, and I was terrified of the content (math). This template enabled us to assign roles and responsibilities for each of us throughout the class period so that both teachers were equally involved. Students got used to hearing both of our voices. We gradually stopped using “I” and began using “we,” which helped create a sense of unity in the class. Did we get a chance to sit down together and plan every day? No. But we did commit to using this template in the beginning. We found that we could plan while conducting our duties, waiting for the copier, and eating lunch if we needed to. We also had a commitment to shared planning time at the beginning of each unit to create an overview and discuss strategies to differentiate based on the individual needs of students in the class. As we became more comfortable working with each other, we agreed that a co-taught class should look and feel different from a solo-taught class. It essentially is an entirely separate class preparation and thus needs dedicated planning time, of which we had none. We modified our template to include the co-teaching models we would implement to meet particular needs. For example, we used alternative teaching when several students (with and without disabilities) needed more practice–one teacher worked with the smaller group of students, and the other teacher worked with the rest of the students. This planning process was initially a little tedious, but we found we could plan on the fly after we got used to the process, and there was no need to write things down all of the time (although keeping a written record may reduce planning time for future lessons). We eventually did have official professional development, which fueled us with even more ideas and made us better co-teachers. That first year was quite memorable with many highs and a few lows. But we survived! We have now moved on to other schools, but we enjoyed our experience and still keep in touch. I still use that lesson plan template because, lo and behold, I have had to co-teach with those I do not know, those who do not really want to, and those who are eager but have no experience. The purpose of the template works like a charm. It starts the conversation and gives the teachers a voice that will ultimately affect the students. We conducted a survey of all students in co-taught classes after 2 years and bringing in 22 more teaching staff to co-teach. When asked about the biggest benefit of having two teachers in the classroom, one of students’ top responses was getting help and feedback quickly. Students felt they mattered. Who does not want to be a part of that? Be flexible. As Catherine learned, flexibility is one of the most critical parts of successful co-teaching. She and her co-teacher were thrown into a partnership that took them both out of their comfort zone, without sufficient planning time–and with creativity, open-minded optimism, and quick thinking, they were able to make it work. Be honest. Catherine and her partner openly shared their feelings of uncertainty as they got started. Being honest and direct helped them build a rapport and work toward solutions together. Create a solid lesson plan template. The clear-cut template Catherine and her partner created helped both of them stay equally involved and helped Catherine overcome her fear of the subject matter. 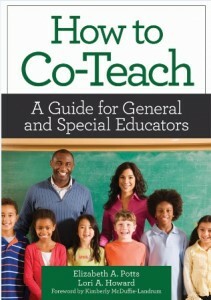 (For guidance on lesson planning, see the book How to Co-Teach, which includes lesson plan organizers for elementary and middle/high school classrooms. Commit to shared planning time. These two co-teachers met at the beginning of each unit to create an overview and plan differentiation strategies. Figure out what type of co-planning arrangement works for you and make it a regular part of your schedule. Seek out professional development opportunities. Catherine speaks highly of their professional development experience, which helped them take their co-teaching partnership to the next level. Never stop learning new strategies–try reading and discussing co-teaching books as a team, taking a web-based class or webinar, networking with other co-teachers, or even asking your school to bring in an outside consultant for professional development, depending on available funding. 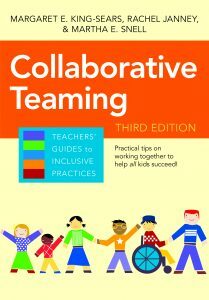 Want more expert insight on co-teaching and other forms of collaborative teaming in inclusive schools? Check out Collaborative Teaming, a practical guidebook that shows your team how to establish trust and consistent communication, conduct productive meetings, make sound decisions by consensus, solve problems and create action plans, and more. 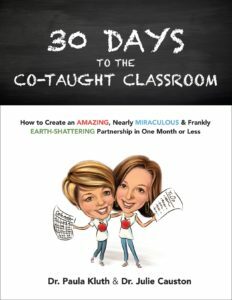 Let inclusive education experts Paula Kluth and Julie Causton teach you all you need to know about effective collaboration–in just 30 days! In this highly engaging how-to guide, Julie and Paula walk you through the information, competencies, and habits you need to become a great co-teaching partner. You’ll discover fresh strategies and to-do items for getting to know your co-teacher, understanding each of your roles, improving your co-planning skills, expanding the structures you use to teach and support students, and celebrating your accomplishments together. Complete with a DVD on effective co-teaching and a helpful Reader’s Guide, this practical introductory guidebook shows special and general educators how to build strong, respectful, and productive partnerships and ensure the best outcomes for all K”“12 students. 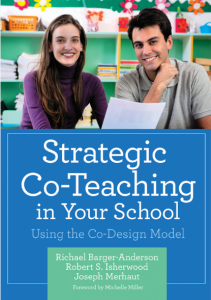 Great for teacher training, this book is a step-by-step guide to the research-based Co-Design Model, a schoolwide approach to strengthening collaboration and inclusion. Includes strategies, success stories, and forms and checklists for promoting collaborative education.